This article describes and identifies the switches, controls, and safety devices used on water tanks and water pumps such as the pump pressure control switch, pump motor relays, water tank relief valve, water tank pressure gauge, water tank air volume control, and water tank air valve. We discuss these well or water pump control questions: What are the functions of the well water pump pressure control switch, water tank relief valve, water tank gauge, water pump relays, water tank valves. 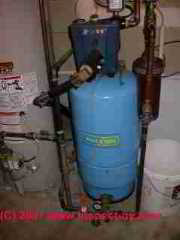 Well pump & water tank diagnosis & repair procedures. This article uses sketches and photographs to assist in locating and identifying all of the controls and switches found on residential water supply systems including the well, water pressure tank, water pump, and their associated valves and devices. 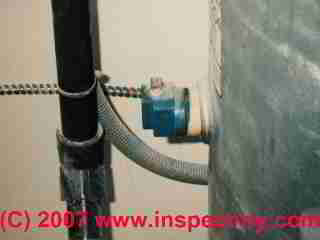 We also provide maintenance and repair and emergency water shutoff tips throughout these descriptions. A water treatment chemical connection, probably from a chlorine injection system (this well water is probably contaminated with bacteria) can be seen as a clear plastic small diameter tube which is fed through a gray plastic tee in the black plastic well piping that connects the well itself to the galvanized pipe leading to the water tank and house supply piping. At the upper right in the photo se see two treatment tank bottoms (black and white smaller diameter tank-like objects partly shown). 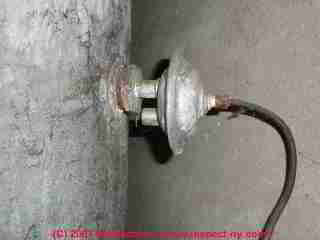 Well pump wiring is also visible: twisted wires can be seen entering the well casing cap at the 1-o'clock position on the cap - so we know that this water system uses a submersible (in the well) water pump. Water on the floor around the water tank and equipment looks like more than we'd find from simple condensation drips - we suspect there's a leak somewhere or a basement water entry problem that needs to be corrected. 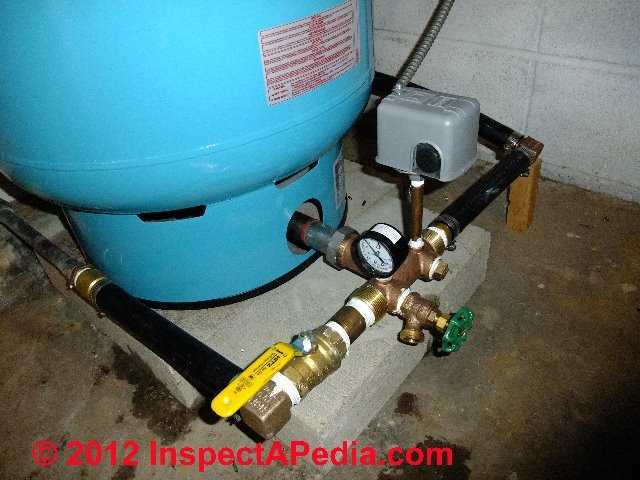 NO RELIEF VALVE is visible in this photo - one should have been installed and may be missing. This is a safety defect and in some jurisdictions a plumbing code violation. The page top sketch is expanded by detailed photographs as we explain each of the components and controls of wells, pumps, and water tanks. 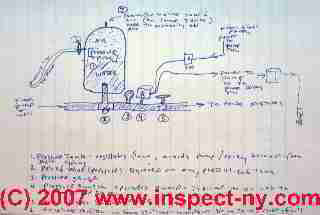 In our sketch (sorry the author is a technician but not an artist), you can identify the basic components of a private well system (listed next) but as you'll see in our detailed articles and photos which follow, these components are not always located where they're as easy to spot and name as in our drawing. 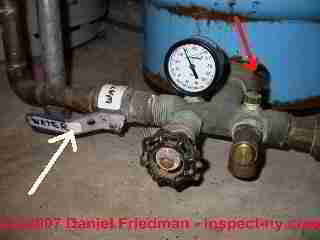 Air valve (Label #7 in the page top sketch and shown in the photo at left) or "Schrader valve" (looks like a tire valve). The water tank air valve shown in this photo is one that you should not normally have to use as it's installed on a captive air or bladder type water tank. On water tanks that do not use an internal bladder, the air valve, or Schrader valve, used to add air to the water tank can be seen in this photo. Details are at TANK AIR INLET VALVE. At WATER TANK AIR, HOW TO ADD we discuss adding the right amount of air to a non-bladder steel or glass-lined well tank. And at WATER TANK BLADDER PRESSURE ADJUSTMENT we discuss fine tuning the pump pressure control switch to work perfectly with the exact air pressure pre-charge in a bladder type well tank. Air volume control (Label #6) and copper or plastic tube connecting the AVC to the water pump or a fitting nearby. An air volume control valve or device is not presentOn "captive air" bladder type water tanks - this control can take several appearances. Here is a photo of a different type of water tank air volume control. 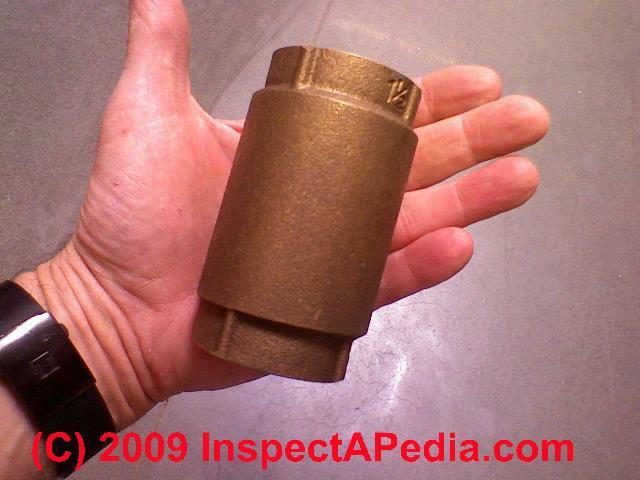 Check Valves on water piping, well pumps, wells. Shown below. Electrical Power (Labeled SW in the sketch at page top) - Electrical switch at the water pump. 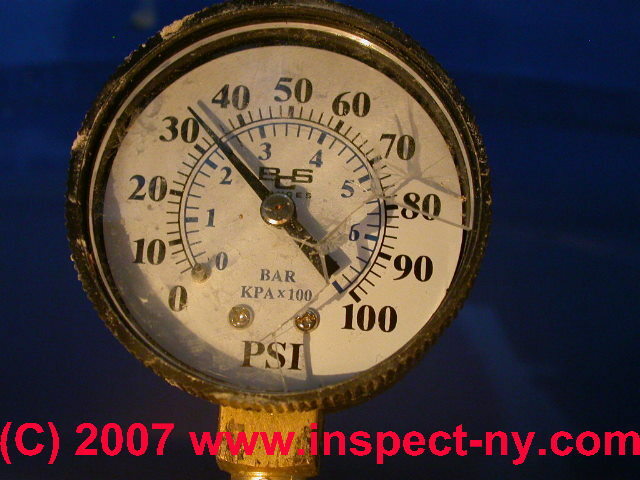 Gauge (Label #3) - Water tank pressure gauge. The water pressure gauge on home water systems is one of the most helpful and simple devices used in diagnosing poor water pressure and pump, well, or pump control problems. This gauge has broken cover and needs replacement. See WATER TANK PRESSURE GAUGE for water pressure gauge explanation and repair advice. Piping (Labeled "from pump & well" at left) - Well piping bringing water from the well to the water pressure tank and building. 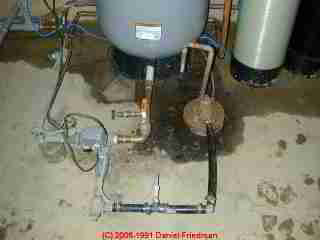 Piping (Labeled "to house fixtures" at right )- Building water supply piping a main water line leaving the water pressure tank and bringing water to the building and its fixtures. Pitless Adapter (shown in sketch below): the pitless adapter provides a water-tight connection that permits the well piping to pass out through the side of a round steel well casing. Our illustration (above left) shows a low-pressure well spool using a clamp-on pitless adapter in a design suitable for artesian wells whose head pressure is equal to or less than 5 psi (a head of 11.5 ft.) - courtesy Michigan DEP. Low Water Cutoff for the Well Pump - Many sources, including the Penn State School of Forest Resources recommend installing a low water cutoff device to protect a well pump that has to operate in an inadequate or low-yield well. That resource describes an electrical low-water cutoff switch. A low water sensing device to protect a well pump may be installed in an intermediate water storage tank, for example. If your well pump has stopped running and an electric low water cutoff switch is installed you'll want to check that the switch is working properly. Pump- Water pump either at or close to the water pressure tank or located separately in a well pit (not shown in this sketch) or in the well itself (shown as pump at far center right in sketch at the top of this article ). The water pump shown in this photo is installed right on top of the water tank and it is easily identified as a "one line jet pump" since we see only a single pipe entering the pump from the well - the black ABS piping coming into the pump from its lower left. The outlet of this one line jet water pump is the copper pipe at upper right of the blue pump assembly. If you do not see a water pump anywhere in the building, and if the property does not use an outdoor well pit or well house, then your well water pump is probably a submersible unit. Relay Switch - Pump relay (Drawn as box at right center in sketch) turns on and off a higher-voltage water pump such as some submersible pumps (not present on all water systems). 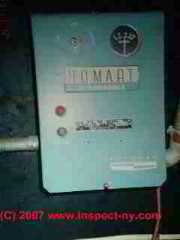 Shown here is a Homart submersible well pump relay switch. Relief Valve (Label #2) - pressure relief valve on the water tank. Water tank relief valves (red arrow in photo) were omitted by lots of plumbers installing pump, tank, and well systems, but most plumbing codes and local codes require a pressure relief valve on any tank which contains something under pressure, including a home water tank. Should the water tank rupture, even at fairly low pressures, a bystander could be hurt or even killed. This actually happened to a plumber in New York state, making pressure relief valve believers out of plumbers in the area. The tank burst, he was killed. 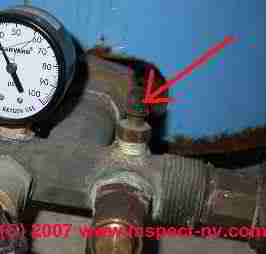 Shutoff (Label #5) - Main water shutoff valve. 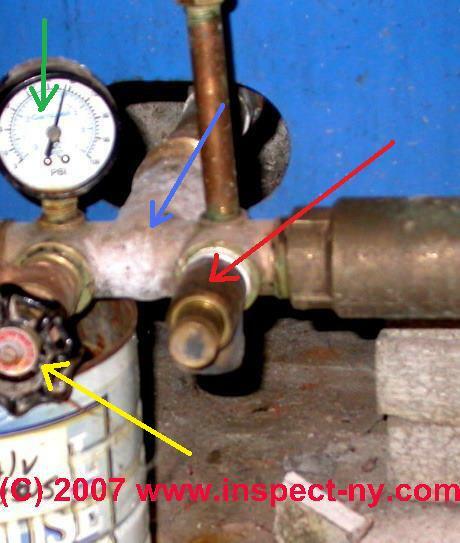 A main water shutoff valve, in this case the blue lever labeled "WATER" with white tape is shown to the left of the pressuregauge and pressure tank drain valve in our photograph (white arrow). Switch, pressure (Label #4) - Water tank and pump pressure control switch. The well water pump pressure control switch is the "brain" of a home pump and well system, sensing the water pressure in the building and controlling the turn-on (at low pressure or "cut-in" pressure) and turn-off (at high pressure or "pump cut-out" pressure) of the water pump itself. All home water pumps use some type of pressure control switch to turn the water pump on and off. See WATER PUMP PRESSURE CONTROL SWITCH for details. at ADJUST PUMP PRESSURE CONTROL. Some well pump pressure control switches incorporate a WATER PUMP PROTECTION SWITCH that may have to be manually re-set. , see WATER PRESSURE FALLS SLOWLY, ERRATIC PUMP: bad pressure control switch, building water running or leak, bad pressure gauge, bad check valve, bad foot valve. at SIGNS OF AIR LOSS. at WATER PUMP PRESSURE CONTROL REPAIR. 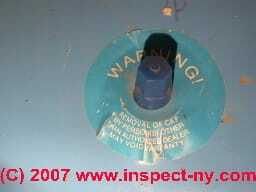 see WATER PUMP PRESSURE SWITCH NOISES. Tailpiece - in the well: The tailpiece is an extension on the bottom of well piping (blue) in our drawing at left. When the well pump's capacity is known to exceed the flow rate of the well, a tail pipe, tail piece, or low water cutoff control is installed to protect the pump from damage such as that caused by well pump cavitation or motor overheating. at WELL PIPING TAIL PIECE. Tank (Label #1) - water tank: The water pressure tank showing air in the upper portion and water in the lower portion of the tank. The water pressure tank in most buildings has the job of smoothing the pressure and flow of delivery of water to the building. At a property whose water well has very limited recovery rate or flow rate, the water tank may be larger, or there may be several of them installed. In this case the water tank is also storing a buffer quantity of water for use in the home so that the poor well delivery rate does not directly affect the occupants in the building. Details are at WATER TANK TYPES: WATER, OIL, EXPANSION, ALL. 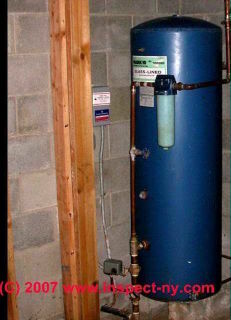 In our photo abov e you can see the bronze water tank tee (blue arrow) attached to the bottom of a water tank, and providing a plumbing connection point for a water tank gauge (green arrow), pressure relief valve (red arrow), and a tank drain valve (yellow arrow) all mounted in this photograph. Detailed descriptions of individual water system parts and controls, valves, switches, pumps, piping, etc., how they work, how to diagnose, repair, or replace them are provided in the remaining chapters of this article and are listed just below. see WATER PUMP REPAIR GUIDE an specific case which offers an example of diagnosis of loss of water pressure, loss of water, and analyzes the actual repair cost. Reader Question: my new water pressure tank came with just a single outlet fitting at the tank bottom - it does not match my old water tank controls and connections - photos of water tank cross unit or "tank tee"
2. in this case he forgot to do so, leaving this system unprotected. I am replacing a tank with bad bladder with a new bladder tank. Unbeknownst to me, there is some difference in the set up of the 2 tanks. The existing tank has the source going directly in the tank (with pressure switch and brass valve inline) and the feed or output is from a separate pipe output fitting in the tank, and the pressure gauge is screwed in another fitting of the tank. The new tank has only 1 connection at the bottom of the tank, with no separate output fitting or gauge fitting. Directions with new tank outline using a "tank cross unit"? That shows both the source and feed pipes going into the cross unit which has a pressure switch mounted. No doubt that scenario allows the use of just the single tank connection for both source and feed. I should mention that I have a deep well submersible pump. Question - can I use my existing set up and adapt to the single connection new tank by merely placing a tee in that single tank connection and running the source in one end and the feed out the other side of the tee with the 3rd branch of course going into the tank? In additon, "if" I can do that, do I then adapt that pressure gauge in the pipe on the feed side of the tee, or just elimnate it? Hope I was clear enough and will appreciate any feedback. B.C. From your description I'm guessing that your tank was sold as a "bare" unit - just the water pressure tank. Other tank assemblies include a brass or bronze tee fitting mounted at that single tank inlet port. The tee, what your instructions call a tank cross unit, incorporates threaded fittings and tappings to accept all of the necessary connections to the water pressure tank: the pressure control switch, pressure relief valve, water inlet from the well, water outlet to the building, a tank drain, and in some cases, a shutoff valve for the line feeding the building. You can use the new water tank that you have, but you'll need to visit a plumbing supplier to purchase the missing parts. at WATER PUMP CONTROLS & SWITCHES you can see photographs of the water pressure tank cross unit or water tank tee we are discussing. You can most likely move over your existing controls and fittings to the new tank cross unit, though in the case of a pressure relief valve and gauge I'd prefer to use new equipment. Continue reading at WATER PUMP PRESSURE CONTROL SWITCH or select a topic from closely-related articles below, or see our complete INDEX to RELATED ARTICLES below. WATER PUMP CONTROLS & SWITCHES at InspectApedia.com - online encyclopedia of building & environmental inspection, testing, diagnosis, repair, & problem prevention advice.